HRH Princess Victoria of Schleswig-Holstein and her sister Princess Christian, were both enamoured of Persian cats and were active within the Cat Fancy. Both owned Blue and Silver Persians, and Princess Victoria made no bones about the fact that her beloved Chinchilla's were her favourites. She sold and exported a number of fine Blues for breeding, among them, 'Royal Bobs' (owned by Mrs. Collingwood of Leighton Buzzard) and 'Amesh' (owned by Mrs. J.V. Gotwalts, of Pottstown, Pennsylvania). But it was to her Silver Persians that she was especially devoted. It would appear that the most significant boost to her Silver breeding program came in 1901, with the birth of both 'Imp II' (born 4th April) and 'Puck III' (born 18th April), both bred by Lady Marcus Beresford at Bishopsgate. These two cats, one female and one male, provided the Princess with some of the best Silver bloodlines available at the time, plus a reasonable degree of genetic diversity. They also made it possible for her to remain an independent breeder of Silvers, without the need to venture outside of her own domain at Cumberland Lodge to secure sound silver lines. So from this time, the Princess was firmly seated in the camp which followed the path for 'Green Eyes' in the Chinchilla cat and was a worthy Patron and fellow breeder/exhibitor. 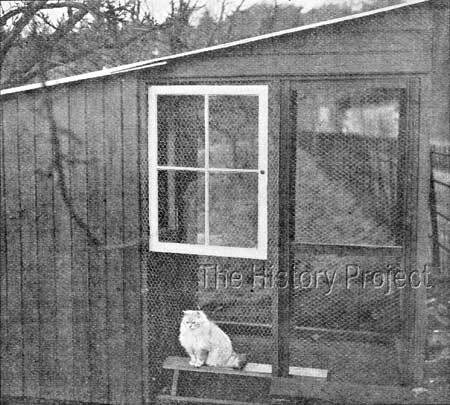 'Puck III' was born at Lady Beresford's famous 'Bishopsgate cattery' on 18th April, 1901. His sire was Mrs Snell's strikingly handsome 'Silver Starlight', a son of 'Silver Laddie' whom Mrs Balding has established as a total outcross for the 'Silver Lambkin' strain. However, 'Silver Laddies' background is unknown and eludes us all to this day. 'Starlight's dam, 'Minnette' descends directly from a Silver Tabby line, headed by 'Ch. Topso of Dingley'. The dam of 'Puck III' was 'Windsor Dimity', a stalwart and excellent breeder,(formerly owned by Miss H. Cochran) who counts among her other famous progeny, cats such as Mrs Clarks 'The Absent-Minded Beggar' and Mr Witt's 'Gossamer' among others. 'Dimity' was sired by the memorable 'Ch. Lord Southampton, so she brought to the pedigree a double on 'Beauty of Bridgeyate' with the memorable outcrosses provided by 'Ch. Nizam' and 'Ch. Bundle'. 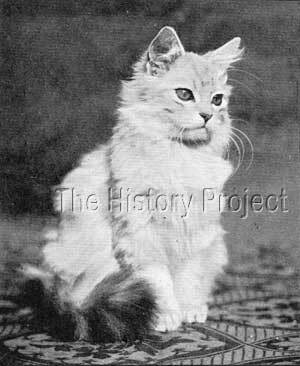 On her dams side, she also was descended from a silver tabby line headed by 'Ch. Topso of Dingley'. So in 'Puck' the Princess obtained a male who directly combined the bloodlines of two of the most fashionable Chinchilla males in the country at the time, namely 'Silver Starlight' and 'Ch. Lord Southampton'. The female purchased at this time, was 'IMP II', sired by Mr C. Witt's 'Prince of the Fairies' who was himself from a powerful combination of 'Lord Argent' with the superlative 'Whitehall Seraph' (aka The Seraph) another daughter of 'Ch. Lord Southampton'. The dam in this case was Lady Beresford's 'Squaw' who although relatively unknown, carried a distant triple on 'Ch. Silver Lambkin', who was already strongly represented in the pedigree of 'Prince of the Fairies'. This combination also brought back another direct link to 'Ch.Topso of Dingley'. In this regard, Lady Marcus Beresford had been a helpful and thoughtful mentor. She had provided a strong base, with elements of line-breeding, but also as an insurance policy against possible losses or any unforeseen disaster. 'Silver Charm' (1897), by Silver Owl, bred by H.Cochran, owned by Miss R Packham and Lady Decies. 'The Absent-Minded Beggar'(1899), by Lord Southampton, bred by H.Cochran, owned by Mrs Nield. 'Gossamer' (1899), by Blue Robin, bred by H.Cochran, owned by Mr C.Witt. 'Windsor Chintz' (1900), by Windsor Beetle, bred and owned by Lady Marcus Beresford. 'Windsor Stagbeetle' (1900), by Windsor Beetle, bred and owned by Lady Marcus Beresford. 'Lord Clive', (1901), out of 'The Seraph', bred by Mrs Marriott, owned by Mrs Evan Humphreys. Of 'Puck's' show wins, information is scarce, although in his stud advertisement we are formally advised that he is a high prize-winner. None are recorded in The Cat Club Register, nor in The Book of The Cat, but it is highly likely that he did in fact take out a number of respectable and highly sought-after wins in the Silver Division at shows, given that we are told his prize cards are displayed inside the living room of his stud quarters! Regardless, his photo shows us that he is indeed a handsome fellow, who continued to pass on his good looks to his progeny, proof of which is provided in the female 'Venus', whose kitten wins are recorded, as well as her fine photo by Russell & Sons, of Windsor. The above litter of Silver Tabbies is very likely to have been sired by 'Puck III', possibly out of the Princess's Silver female 'Chela' who was more heavily barred than either 'Imp' or her own 'Venus'. The photo is taken from a Rotary Photo postcard in The Harrison Weir Collection, but a cropped version of exactly the same image appears on page 167, in Frances Simpson's The Book of The Cat. Interestingly, very few of 'Puck's' progeny are listed, with the exception of a litter from his cattery mate 'Chela' which resulted in three daughters named, 'Princess Victoria', 'Princess Alexandra', and 'Princess Olga II' respectively. 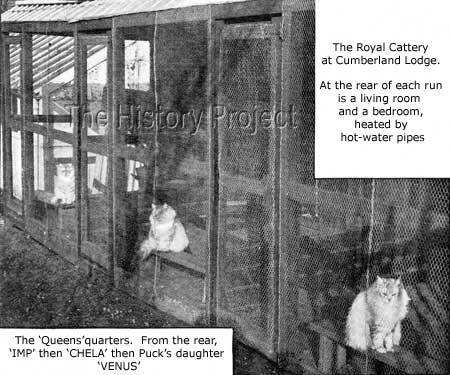 However, we have successfully tracked two other relative unknowns, one being his silver daughter 'Venus' whose wins as a kitten are recorded in a 1903 issue of Our Cats which we quote in full below and whose image appears in an article on the Cumberland Lodge cattery, featured in Cassell's Magazine, circa 1903. 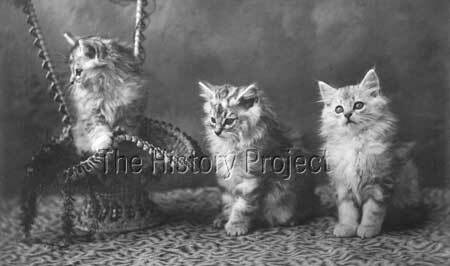 It is also probable that in the above photo of three silver tabby kittens, the lightest kitten of the three (far right) could in fact be 'Venus'. It was not unknown for chinchillas to begin as barred silver tabbies and to slowly lose the majority of their markings during development. 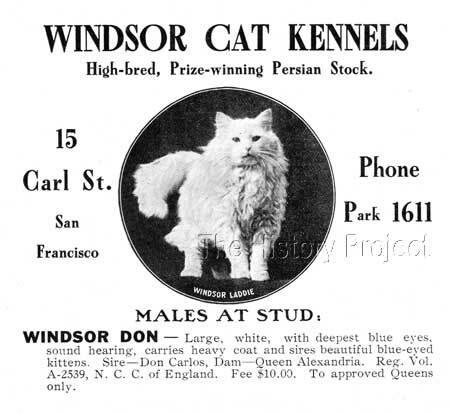 In another litter, out of a blue-eyed white female, 'Windsor Queen Alexandria', 'Puck' appears to have sired the White male 'Windsor Laddie', who was exported to the United States, to the 'Windsor Cat Kennels' of Carl St, San Francisco. In evidence of this, we have to hand a full page cattery advertisement, from the Show Catalogue of the Pacific Cat Club Show, held on 5th and 6th February, 1909. In this advertisement there is a small photo of 'Windsor Laddie' along with a second listing for a cat named 'Windsor Don', another White male , 'with the deepest blue eyes', who is also listed as sired by Don Carlos (a blue son of Ch. Ayrshire Ronald) and the same white dam, 'Queen Alexandria'. 'Venus', a Chinchilla sired by Puck III, bred by HRH Princess Victoria. Photo image of 'Windsor Laddie' a White son of 'Puck III' and a listing for 'Windsor Don', his White half-brother from the same queen, sired by 'Don Carlos' a blue male by 'Ch. Ayrshire Ronald'. "Mrs Coddington, a Californian lady has brought a lovely queen over to England with her in order to mate with Puck III. This cat, by name 'Queen Alexandra', is a beautiful white longhair, with very large blue eyes. It will be very interesting to see what kittens result from such a mating. 'Queen Alexandra' took first and two specials at two shows in San Francisco." Obviously 'Windsor Laddie' was the subsequent result of the planned mating. One can only wonder how long 'Queen Alexandra' must have been resident at Cumberland Lodge, before the mating took place, and the delicate condition and arrangements surrounding her safe return to California! It is surely a credit to the organisational skills of both Mrs. Coddington and HRH Princess Victoria of Schleswig-Holstein, that the mission was a complete success. "Cumberland Lodge - The Princess Victoria has so far recovered from her illness that she has returned to Cumberland Lodge and has walked round to the pretty cattery there to see her pets. Chela has five lovely kittens and Imp has two, both families by Puck III., who sires very fine kittens. On August 7th there was great excitement in the cattery. 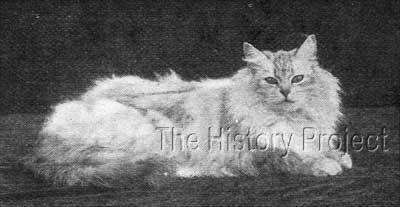 Prince Christian's cat, Ladybird by name, had a flourishing family of nine by Puck III. She has beaten the Cumberland Lodge record. Miss Amor, would sell some of these pretty kittens for about a pound apiece, or give one or two away to be sold for a deserving charity." 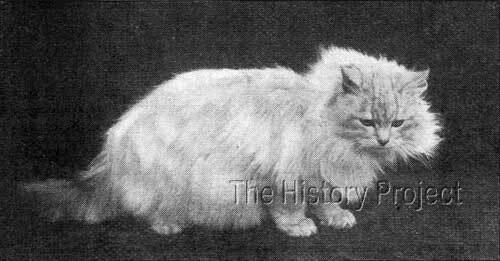 Prince Christian's cat 'Ladybird', dam of a litter of nine, sired by 'Puck III'.